Bittersweet Enchantment: What The Spell? by Brittany Geragotelis / ARC review and Giveaway! What The Spell? by Brittany Geragotelis / ARC review and Giveaway! I simply adore books about witches, always have. I jumped at the chance to read What The Spell? by Brittany Geragotelis. I was first introduced to Brittany by a mutual author friend, Lori Curwell. Lori told me that Brittany was recently signed with Simon & Schuster after being a self-published author. I found out more info about her books and was soon sent an ARC to review. I must say I was pleasantly surprised by how amazing What The Spell? turned out to be. Brooklyn has a big secret...in which no one else knows, well besides her parents. Brooklyn is a WITCH and on her 16th birthday he parents will un-bound her powers, her birth right. She has waited her whole life to gain these powers and wants to use them to transform herself into someone "everyone" will take notice of. After she receives her powers the first thing Brooklyn does is chance her appearances from head to toe. Long Blonde hair, eyes the color of the ocean, model tall, clear skin, and a rocking body! Wow, what a few spells can do to change boring Brooklyn into America's Top Model. Being invisible was no longer a option. From as long as she can remember Brooklyn has wanted to be apart of a group at school called "The Elite". A powerful clique of the rich, beautiful, and most popular kids in school. The Untouchables. With Brooklyn's new found beauty and drastic change she hopes to be finally noticed by the group, or even asked to join. Although she discovers being beautiful does not give you a free pass. When "The Elite" do take notice of Brooklyn on her first day back to school she comes to find that being a part of their group is no easy task. She is asked to do a series of tests to pledge her legion to The Elite. Easy, right? Wrong! Using her magic is the only way to completes the tests...and getting caught is NOT an option. What's a witch to do? Will Brooklyn's new looks and popularity be enough to win The Elite over or will she use her magic for all the wrong reasons? The Good, The Bad, and the witchy? What I liked most about this book is the main character growth throughout the story. In the beginning Brooklyn felt very insecure and alone, but once she came into her powers she evolved into a more positive person. I guess the one thing that bugged me about Brooklyn is that once she became this beautiful girl who everyone wanted to be like, she lost her true self. She would do anything, including using magic to be accepted. Along the way she even went as far as changing her inner self her, heart to fit it. I really enjoyed seeing her character grow and change throughout the book. The story itself was very intriguing and captured my attention right from the start. I loved the use of witchcraft...the spells, and learning about her family's past. I found the book hard to put down, always wanting to find out what would happen next to Brooklyn. The authors writing style was very smooth and has a elegant flow from page to page. A fantastic book for all ages, and especially the young adult crowd, coming to age readers. The only problem I did have with the book was the way Brooklyn acted after be tested my The Elite. She was willing to do practically anything to gain acceptance even if that meant giving up her true self. She wanted to be liked so much that Brooklyn figuratively speaking "sold her soul" to get there. The ending was positively perfect and I can't wait to find out what's in store next for this little "witch". Thank you everyone for taking the time to read my review. :) I really enjoyed What The Spell? and I hope you all will too. The spectacular people at Simon & Schuster have offered my readers a chance to win a finished print book copy of the book. Unfortunately because of shipping cost the giveaway is open to only the US residents. Great review. I liked what you said about the book having a lot of character growth. I always appreciate that in books and it has made me want to read this one even more! Also, thanks for hosting an awesome giveaway! I love all types of supernatural books. This one sounds great. I really want to win this. I've been dying to read the book. I love Witchy books. There aren't enough of them. Especially not fun and lighthearted ones. This seems like it could be just the ticket for a bad day pick me up. And your review makes it sounds even better. So, thank you! 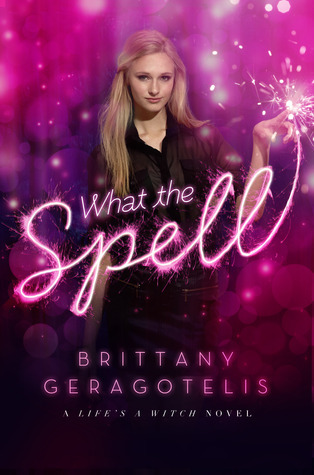 This books sounds super interesting and I love reading about witches and each author's different take on witchcraft and would love to read what Brittany has done in What the Spel? Also, I love the title! I have wanted to read this since I stumbled across it on GR. It looks like a really fun read, but with a good message. It also bodes well that it has been pretty highly rated there.